Whether it’s a world music or dance performance, a lecture, conference, or symposium, an international film festival, or a cultural celebration, International House presents public programming that advances cross-cultural understanding and promotes opportunities for civic discourse on community, national, and world affairs. For over 85 years, programs such as our Global Voices Program have provided Chicago’s citizens, universities, cultural institutions and community groups meaningful engagement with master artists, scholars, and leading figures from the world stage. 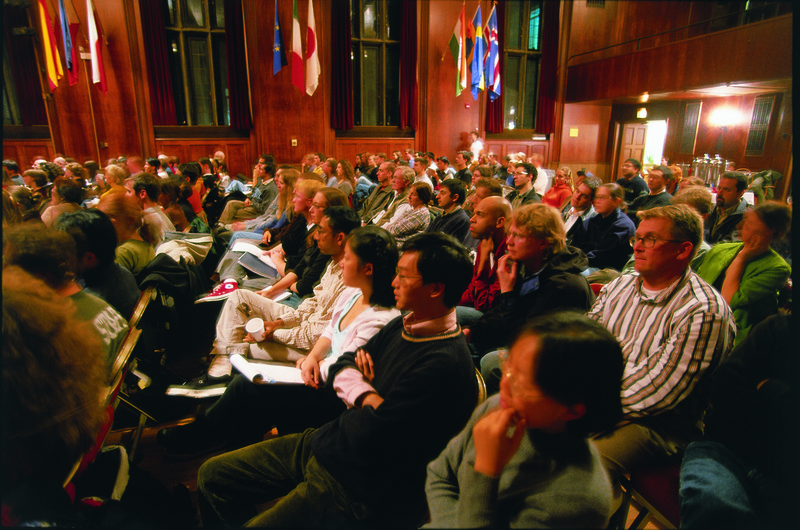 Situated in one of the most culturally diverse cities in the world and located on the campus of the University of Chicago, International House builds on its historic and educational position as it continues to expand its role as presenter and co-sponsor of innovative, internationally-focused programs. Through the Global Voices Community Co-sponsorship Program, International House offers its conference venues, performance space and professional support to educational and cultural organizations, as part of an ongoing effort to foster culturally authentic programs and to raise awareness of contemporary global issues. We invite your group to apply for Global Voices Community Co-sponsorship when planning your next public event. Apply for Co-Sponsorship and Venue Usage using this form. There are five original International Houses - in Berkeley, Chicago, New York, Paris and Tokyo. They were all built with funds provided by John D. Rockefeller, Jr., at the suggestion of Harry Edmonds, a YMCA official. Both men believed that if American and foreign students could live, work and study together in a comfortable multicultural environment this would lead to friendships and increased international understanding. Since International House at the University of Chicago first opened its doors in 1932, it has provided a “home away from home” for nearly 40,000 individuals from around the world. Designed by the legendary Chicago architectural firm of Holabird and Root, International House is a nine-story gothic building which centers around a fountain courtyard and soars above the Midway Plaisance, the historic site of the World’s Columbian Exposition of 1893. Facilities include the spacious Assembly Hall, elegant meeting rooms and banquet facilities. International House is more than just a residence for individuals from around the world. Educational and cultural programs such as music, dance and theatrical performances, forums and debates on world issues, and our cultural celebrations are among the hundreds of activities enjoyed by International House residents and members of the Chicago community. 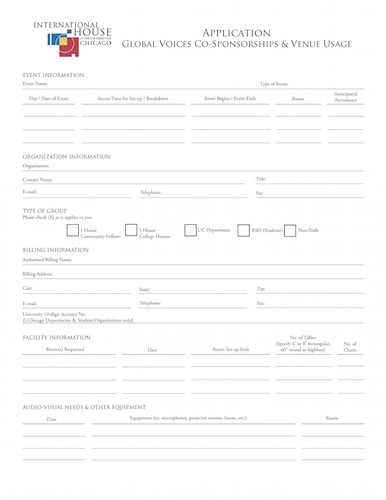 Download Global Voices Community Co-Sponsorship & Venue Usage Application and Terms.